I was living in Los Angeles in 2013 when the Los Angeles Unified School District began implementing its ill-fated plan to provide all of its 640,000 students with iPads. I am now living in El Paso, Texas, where the El Paso Independent School District recently completed its (admittedly much smoother) roll-out of laptops for all of its 60,000 students. I could likely be telling a similar story regardless of where I lived considering the frenzy across the country to get devices into the hands of students. While I think the goal of providing equitable access to educational technology is laudable, I am consistently amazed at the lack of foresight demonstrated by districts when it comes to what teachers and students should do with the devices once they have been distributed. As I have ranted before, the devices do not magically transform learning — strong pedagogy does that. And, I do not see much evidence of sustained, meaningful professional development being offered to teachers so that they can create strong, technology-enriched pedagogy. The fact that many teachers use technology in their personal lives does not mean that they will magically use it in their professional ones. A recent study has indicated that, even as the push to get more technology into classrooms continues, teachers are becoming more wary of its value and more hesitant to incorporate it into their teaching. I am concerned about the possible backlash to come because, as the Digital Media and Learning Research Hub and Connected Learning Alliance communities have demonstrated, technology has the power to offer transformative educational experiences to young people. I am beginning to think that the way to broadcast this message far and wide in a way that encourages teachers to find more meaning (and fun) to technology integration is to begin applying the connected learning framework to adult education — specifically to teacher preparation. Often lost in the frenzied push for teachers (and teacher educators) to incorporate digital literacy into their practice is the simple but crucial point that many will be unable or unwilling to do so if they do not have the opportunity to develop their own skill sets, find connections between digital tools and the kinds of meaningful learning opportunities they desire for their students, and wrestle with issues of equity and access. So, that is what I did in my recent “New and Multimodal Literacies” course for pre-service and in-service English teachers. I structured the course to help teachers move from passive consumption of digital media toward active production of multimodal texts. I also designed course activities to help my students understand the unique contributions of technology to a more connected vision of teaching and learning. 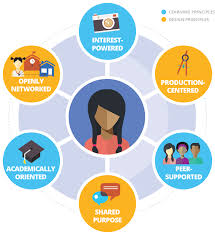 Our work was guided by connected learning principles — students worked in peer-supported groups to decide upon a digital tool that they have interest in exploring, their products were shared across various networks, and they designed learning experiences with equity and access in mind. Educators face unique challenges as they seek to develop instructional strategies that work well in the digital learning environment and that match up with the subject area content they need to teach. The term “technology, pedagogy, and content knowledge” (TPACK) has been developed to conceptualize the complex interaction between digital tools, instruction, and curriculum that teachers of digital literacy must navigate, and I wanted to know if and how connected learning can help teachers develop TPACK competencies. I hope that this resource will help you think about the role of digital technology in the lives and practices of the teachers and students you work with. This resource was adapted from a post on DML Central. The original post can be accessed here.